The Three Strike Rule: "The Great American Dream Machine"
A new DVD release introduces this groundbreaking series to a new generation. When the conversation about groundbreaking television variety series begins, the big guns are always mentioned: Saturday Night Live, Monty Python’s Flying Circus, Rowan & Martin’s Laugh-In. Missing from that list is a little known gem called The Great American Dream Machine. Unless you’re a TV historian, or you came of age in 1971, then you’re probably like me and have never heard of it. 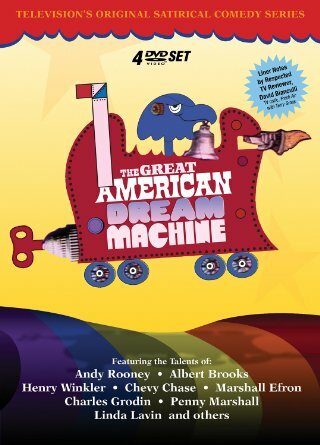 S’More Entertainment hopes to remedy that by releasing The Great American Dream Machine on DVD for the first time. This 4-disc set contains nearly 13 hours of the irreverent TV Magazine series that aired on PBS for two seasons from 1971-1972. Each episode of the mixed media show featured no host, no narration, and no set format. The writers, directors and cast were given free reign to poke fun at politics, mass culture, and advertising, while also offering thought provoking segments asking people on the streets questions like “what is love” and “what is the American Dream.” Among the notable contributors were artists who would go on to greater fame, such as Albert Brooks, Chevy Chase, Charles Grodin, Penny Marshall, Andy Rooney and Henry Winkler. Legendary Chicago journalist Studs Terkel hosted a regular segment called “Talkin’ with Terkel,” in which he sat in a bar with a diverse group of people to discuss politics, the war on religion and their own aspirations. As a newcomer, I feel that The Great American Dream Machine is less like Saturday Night Live and the satire driven shows that followed in its footsteps and more like a grown up version of Sesame Street. That isn’t meant as a put down. The long running children’s show has used mixed media to teach lessons and help kids to think outside the box for 45 seasons. The Great American Dream Machine is working on that same current, except with deeper themes. Each episode is tied together with an overarching idea relating to the social and political satire. Even a feature on Evel Knievel and his thirst for fame and material objects ties into one of the shows central questions: What is a hero?